ASTMT has realized the importance of educational innovation and development, since the early days of its establishment in 1972. The College of Engineering and Technology, at AASTMT, was established in 1990. Currently, the College of Engineering and Technology offers Bachelor and Master degrees in the areas of architectural engineering and environmental design, computer engineering, construction and buildings engineering, electrical and control engineering, electronics and communications engineering, industrial and management engineering, marine engineering, and mechanical engineering. All programs offered by the College are acknowledged by the Supreme Council of Egyptian Universities (SCU) and fully accredited from the British Professional Institutes (IMechE), (IMarEST), (IET), (ICE), (IStructE), and (IHT), beside the accreditation from the Royal Institute of British Architects (RIBA) parts 1 and 2 for the architectural engineering program. Also all college programs, except Architecture & Environmental Design, obtained theABET accreditation since 2010. The core objective of the college is achieving Excellency in all provided educational services, throughout the effective implementation of continuous improvement concept, as well as the success in obtaining and renewal of all local and international accreditations. Numbers of qualified and competent faculty members have increased drastically during the last five years resulting in huge developments in research activities whether to obtain research funds from local and international entities or to publish in the highly ranked and prominent scientific journals. Also, higher admission requirements combined with a competitive system of scholarships have been applied to attract high quality students. Furthermore, continuous development of educational resources, lab facilities, and campus infrastructure has been a constant activity in the College to maintain delivery of its quality services to students and faculty members. As a step forward towards the enhancement of the relationship between the industrial and academic communities, the Industrial Advisory Committee was holding meetings on a semi-annual basis. These meetings discuss the opportunities of students practical training, market needs in the colleges graduates and finally the industrial problems that may be treated in the research projects. 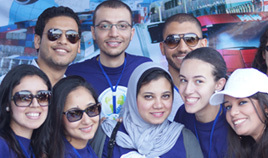 Supreme Council of Universities (SCU), Egypt. The National Authority for Quality Assurance & Accreditation of Education (NAQAAE), Egypt. The Engineering Accreditation Commission of ABET, USA. As a result of the scientific excellence of the College, along with the distinguished level of its teaching staff and its state-of-the-art laboratories, the AASTMT has earned an international academic accreditation from the American Accreditation Board for Engineering & technology (ABET). Under such accreditation, Bachelor of Science degrees in Engineering awarded by the Academy are equivalent to their counterparts in the most prestigious U.S.A universities. This academic recognition is valid seven years (till 2023), which exceeds the five-year period usually given, bearing yet another testimony to the distinction of the College of Engineering. Accreditation by the British Professional Engineering Institutes of the Bachelor of Science in Engineering degrees offered by Arab Academy for Science, Technology and Maritime Transport The Arab Academy for Science, Technology and Maritime Transport pursues a constant policy designed to develop its educational programs and link them to internationally reputable educational institutions. Such endeavor arises from the Academy belief in the positive impact of such interaction on its graduates. Accordingly, the College of Engineering and Technology obtained the British Engineering Professional Institutes accreditation of the Academy Bachelors of Science. These institutes are. Institute of Marine Engineering Science and Technology (I Mar. EST) Bachelor of Science in Marine Engineering programs. Institute of Mechanical Engineering (I Mech. E) Bachelor of Science in Mechanical Engineering programs and Bachelor of Science in Industrial and Administrative Engineering programs. Institute of Electrical and Electronics Engineering (IEEE) Bachelor of Science in Computer Engineering programs Bachelor of Science in Electronics and Communications Engineering program and Bachelor of Science in Electrical and Control Engineering program. Institute of Civil Engineering and Institute of Structural Engineers (I Struct. E) Bachelor of Science in Construction and Building Engineering program. Royal Institute of British Architects (RIBA) Bachelor of Science in Architectural and Environmental Design Engineering program. This accreditation came after The Academy success in adapting and developing its engineering credithour-system programs so as to be consistent with their British counterparts. The College of Engineering & Technology offers a dual undergraduate program in cooperation with Northampton University in England. The student can enroll in the program from the first semester of the study and earn a Bachelor Degree from Northampton University ( UK) in addition to that of the Academy at graduation.